My Mother, Thomas, Marianne, and William before the Rexburg Tabernacle Orchestra concert. This is the concert in which Richard performed all three movements of the Mendelssohn Violin Concerto. I feel bad that I didn't have them dressed a little nicer (I usually do), but I guess I was just too busy and stressed before the concert to think about it! On stage. Someone turned on the heat before the concert, and we were all up there melting! Richard said the heat made it really hard to play, but he still sounded beautiful which is just proof that miracles do happen. Richard and Marianne after the concert. She was so proud of her Daddy! Grandma Burt, Trev (my brother), Granddad Burt, and Dad. It really means a lot that our family comes and supports us! So, thanks to everyone that came, and thanks to those who would have come, but just couldn't make it. We felt your love and support too, and appreciate you! The kids with Richard's parents. This is my niece, Magan, on the left with her friend, Annie. These two girls are both students of mine. They sat on the very front row - so cute! Lance and Becky - my brother and sister-in-law. Richard and I with LaMar Barrus after the concert. He was our violin instructor when we attended BYU-I (then Rick's College) and we both gained so much from him. He has since retired, but we feel blessed that through this orchestra, we can still glean from him his knowledge of, and passion for music. After the concert, we had a little reception at our house. I don't often plan gatherings like this with fancy refreshments, so when I do I want to make sure I have record of it! Here is proof that we had some great food! Chocolate Eclairs from the college, and violin cookies that my Mom so graciously made for the occasion. And that wasn't all... YUM! This is Mindy Davis with her daughter, Molly. They are our neighbors and friends. Molly is a great fellow violinist attending BYU-I, and Mindy is...AMAZING! She helped me plan this reception and provided some of the refreshments. Once again, we feel so blessed to know such wonderful people who give us so much support! THANK YOU!!! We love you! Sarah and James eating the goods. Our wonderful renter, Amy, watched these two during the concert and helped get the house ready for the reception afterwords. I never could have pulled all this off on my own. Thanks Amy! We were so thrilled to see some of Richard's good friends at the concert. Trent Gundersen and Patrick Cullen both drove far distances to see Richard perform. They were all good buddies in high school, and they all played violin in the orchestra together. My grandparents have always been some of my biggest fans, and have inspired me since I was just a little girl. We couldn't ask for better parents! Thanks for all you do for us. We love you!!! Also, I think Marianne must have been playing at a friends house during this time, because I am sure she would have participated had she been home. It was literally impossible to climb up the boxes without some sort of help, so they tied this rope (Thomas' Tai Kwan Do belt to be exact) to the banister. I even had to use it. The boxes were really slick! After a while, it wasn't exciting enough to just slide down on their bums, so they tried out a few other items. Here is Thomas using his pillow. Is that a laundry basket Thomas is holding? A laundry basket with wheels no less. Hmmmm...Not sure about that one! If you look down the stairs at William and James, you can see William holding a box. 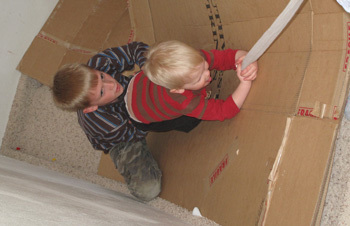 Yep, sliding down boxes in a...BOX! Makes perfect sense!!! ...and a plastic container lid. Do you think Thomas let James get out of the way before going down? Well, there were no serious injuries, so I suppose he must have. They spent quite a bit more time trying to get up the stairs than they did actually sliding down. Watching them struggle to get up was even more entertaining! I have still been trying to figure out my camera and have much to learn. Here, I was experimenting with close-ups of James just after his nap. He was acting so peaceful and sweet. (So out-of-character!) So, I took a couple shots and I really liked how they turned out. I love that smooth skin and cute little profile when they are young. When I stop to think about it, I get sad that he is growing up so fast!!! 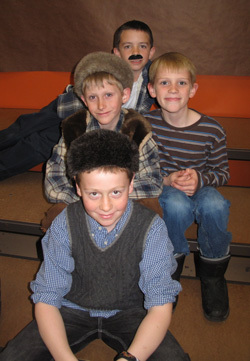 Here is Thomas with a few other boys before the 4th grade Lewis and Clark program. And, no, he did not dress up like most of the other kids. His mom is just not that on the ball (poor kid), but I don't think he was all that interested anyway. He did really enjoy this program, however, and talked a lot about it during the days leading up to it.